The naming of the rotation from doors raises a lot of questions for most people. On this page you will find explanation about the rotation of doors, different doors and locks as well as an explanation about the difference between left and right door fittings which sometimes occurs. 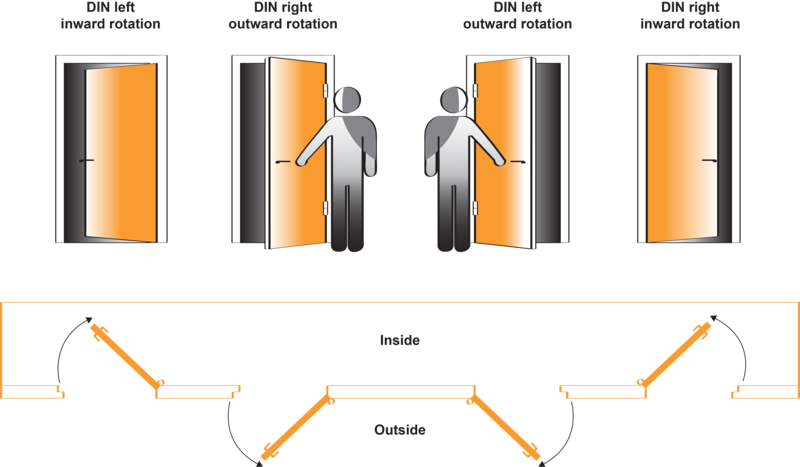 We have some tricks for you which you can use to determine the directions of rotation from your doors. There exist quite a lot of misconceptions about what direction has been applied to the door. If you are going to buy locks and hardware it can be necessary to know this. Since 1962 an ISO standard has been established which is used to avoid confusion. In the Netherlands we work with the DIN standard, this standard originally came from Germany. In this standard DIN left and DIN right is used. When does a door turn to the left and when does the door turn to the right? If you see the hinges on the door, the door will open towards you. When you look at the door and you see that the hinges are situated on the left side of the door, then it is a left handed door. If the hinges are situated at the right side of the door then we speak of a right handed door. Left or right turning is the same as left or right closing and the same as DIN left or DIN right.